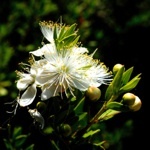 Myrtaceae - myrtle family Dicot. Greek myrtle grows as an attractive pyramidal shrub in hot, dry, sunny locations. It has small, glossy, dark green leaves; in mid-summer the bushes are covered in creamy, white flowers which emit a delightful perfume. The leaves contain aromatic oils and they are used like bay leaves to flavour foods; the small branches can be used to wrap meat before roasting or cooking on a barbecue, imparting a spicy fragrance. The dark blue berries have a sweet juniper like flavour; in Sardinia, the berries are used to make a liqueur, Mirto. The myrtle tree was sacred to Aphrodite and was planted around her shrines; she was often depicted wearing a garland or girdle of myrtle. Symbolising love and marriage, myrtle has become traditional part of royal British weddings; the bride always has sprigs of myrtle in her bouquet.